Winter hit early in Central Ohio this year. Between the snow and freezing temperatures, several school districts have already declared a handful of snow days or school delays, which mean Blizzard Bags are coming into effect. 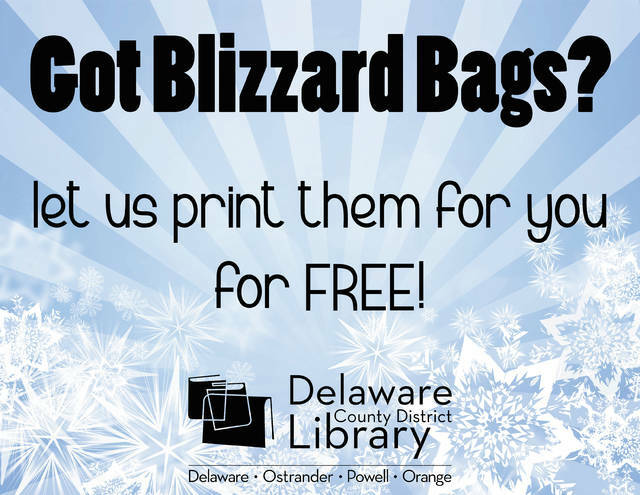 To help Delaware County students, the Delaware County District Library (DCDL) is once again offering free printing for any student who needs to print assignments from their Blizzard Bags. Printing at DCDL normally is 5 cents per page for black and white prints and 15 cents per page for color. Students requesting free Blizzard Bag printing should ask a library staff member for assistance. “Since the official start of spring isn’t for another 66 days and we’re living in Ohio, we know the possibility of another large snowstorm looms around the corner. I always enjoy helping students with their academic needs, from printing and homework help to showing them our free online resources,” said Pottle. For more information contact Communications Manager Nicole Fowles at nfowles@delawarelibrary.org or 740-362-3861.